Spent the early part of this week in Chicago, where I was able to check another must-taste espresso joint off my list: Intelligentsia. These guys are right up there in the CoffeeGeek pantheon, producing a good share of US Barista Championship top contenders, and blazing the trail for single-origin micro-lot coffees nationally. I got to check out two of their shops in Chicago - in both places getting hopped up enough on caffeine to walk out a little wobbly. Geeky, I know, to risk getting cut off at a COFFEE bar. Both were excellent, though the Lakeview store had a much better vibe - more sparse, more funky and more fun than the more bustling, business-like Millennium Park location. Truth is, though, I'm still struggling a little with my take on the place. It was clearly top notch - the barista in Lakeview tossed two macchiatos before she got one she liked enough to serve - but the drinks themselves, and the experience overall didn't quite hold up relative to Victrola or Stumptown. 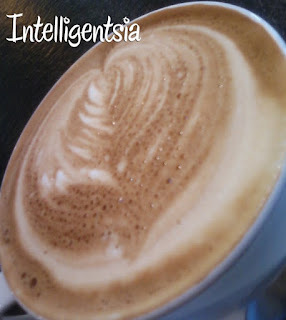 Black Cat, Intelligentsia's espresso blend, is roasted significantly darker than other places of this caliber. The roast yielded an espresso that was exceptionally smooth, but with less body less nuanced flavors than I was expecting. 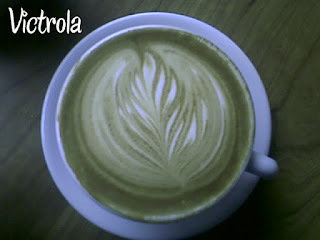 The Victrola latte was clean, clear and silky smooth. 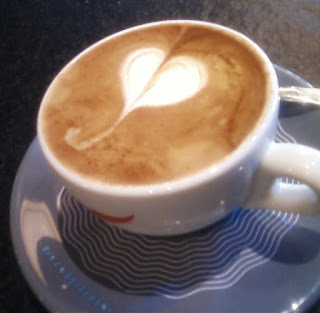 The Intelly latte was by comparison, choppy and heterogeneous, with larger, less consistent bubbles. Just before I left, I went back up to the counter and ordered a coffee from one of the only operational Clovers in the country. The Clover is a $20,000 piece of coffee genius. It allows complete control of the process of making a single cup of coffee - temperature, brewing time, grind, dosing. Word was that the Clover was going to change the way the world drank coffee, and I must have read a dozen first person accounts of how the Clover had revealed flavors in coffee that no one had ever dreamed of. Then, Starbucks bought the company, and clamped the window shut on independent stores like Intelligentsia getting more. Expectations high? You betcha. But I found the actual result - I ordered a cup of a micro-lot Honduran - a little disappointing. There was an exceptionally clean finish, and crisp citrus flavor that reminded me a little of lemongrass. But as with the espresso, the body was lighter than I expected, and I had to strain to taste the richer undertones. It was an excellent cup of coffee, but didn't compare to the depth of Paradise Roasters Lake Tarwar or Cuvee Coffee's micro-lot Brazilian in my humble little french press at home. There's no question that my expectations of this place were sky high; and my quibble were really just that. If I lived around the corner from an Intelligentsia shop, I'd be in there every last chance I got, drinking in the smells and sounds and feel of a place clearly passionate about really good coffee. What is the Most Popular French Press Coffee Maker? fair morning blue giveaway on The Bright Side Project!